I have finally decided what the mystery thing needs to be: a hat! It was so cold when I went out to feed the animals, the only thing I wanted to do was knit a hat. Since my mystery thing was started and needed to be finished, I pulled it out. 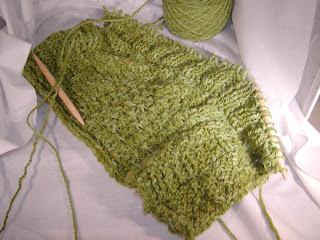 I have about half hour to knit and one more pattern to put in it. I will wear it in the morning. If you read this and want the complete pattern for free, email me within the next week. I plan to publish it for sale after that. I will post a finished picture in the morning. I have come to the conclusion that I need to design patterns. They will sell on etsy. Yarns ought to, but will probably only start to sell after people visit and touch my yarns. Guess there is a place for everything. Felting is still really popular. I am trying to finish my southwestern Monet. I am making progress and should have been working on it instead of my hat, but I NEED to be warm!